My husband, Jared and I could give the most polite Canadians around a run for their money when it comes to saying, “Sorry!” for things about which we have absolutely no business apologizing. You don’t feel like working out? Sorry. A bad driver cut you off on your drive home? I’m so sorry. You want to go to a party and I’d prefer to stay home and read? Sorryyyy! The thing is, I honestly do feel … well, if not “sorry,” exactly, some feeling resembling regret or sorrow in each of these scenarios. I want everyone in my life to be happy and have nice things and do all the things that make them smile, you know? And here’s how I’m revamping my “I’m sorry” habit in each case. I mean, it’s a fact that there are times when I’ve done something for which I should apologize. Like, if I step on your foot by accident, or I have to back out of giving you a ride somewhere? I’ll apologize. And I’ll mean it with my whole heart. 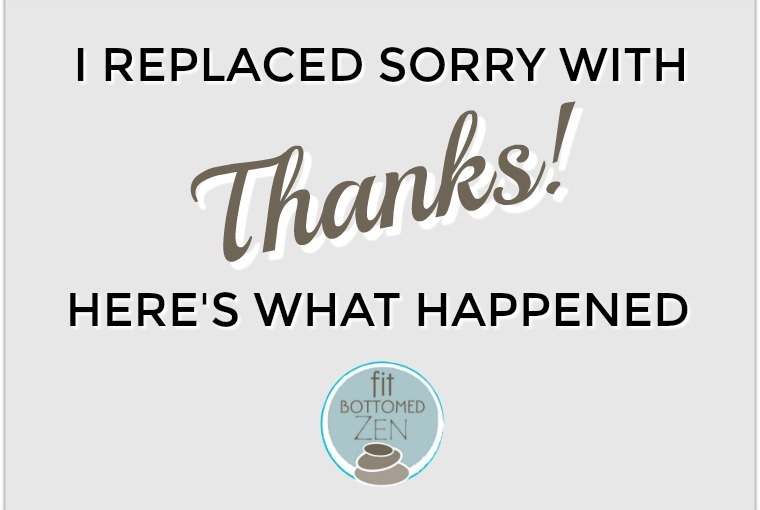 And in those occasions when saying “Sorry,” was truly nothing more than a reflex, like when my husband would complain about being stuck in traffic, or a friend would be concerned about a large and unexpected bill? I’m finding that acknowledging their sucky situation — “Traffic is such a bummer!” “Gosh, that bill is really high!” — feels far more authentic. If there’s something I can do to help, I offer, but if not, simply empathizing (without bringing any feelings of guilt or responsibility into it) is totally sufficient. I’m late: Thanks for waiting so patiently and being flexible! I cooked something you hate: I appreciate you being open to trying new things. Let’s order a pizza — and you pick the toppings! I can’t feed your cat: It means a lot to me that you’d trust me with your beloved kitty. Thanks for asking, and I’m in next time. Can I give you the number for my pet sitter? Do you see how that creates a totally different dynamic? It’s friendlier, for sure, and feels so much more positive. Instead of breaking myself down, this kind of interaction builds the other person up. And that’s not the only benefit. Jared and I have been focusing on this for a couple of months now, and it turns out that, the more you focus on finding reasons to be grateful, the more grateful you naturally become. (Funny how that works, huh?) Rather than one of us feeling kind of bad about something trivial, we automatically look at what we can be thankful for in one another given the situation — and it’s rarely too hard to find something. Now, while we sometimes joke a bit and find ourselves really stretching for a reason to be grateful, we really do focus most of the time on making this an exercise in authentic gratitude — and, for that matter, just tuning into our authentic feelings and reactions. It’s some fascinating stuff — and it’s only improved our relationship with one another and our relationships with those around us. Excellent post! Empty apologies drive me crazy, and I appreciate your idea to try gratitude instead.